Truffled Toast - A recipe from Savor California, the online showcase for extraordinary gourmet foods and beverages from California. Cook radicchio with salt and pepper in oil in a deep 10-inch skillet over moderate heat, stirring, until just tender, 2 to 3 minutes. Transfer to a bowl and keep warm, loosely covered. Wipe skillet clean. Fill skillet with 1-1/4 inches cold water. Add vinegar and bring to a simmer. Break 1 egg into a cup, then slide egg into simmering water. Repeat with remaining 3 eggs, spacing them in skillet, and poach at a bare simmer until whites are firm but yolks are still runny, 2 to 3 minutes. Toast bread, then spread one side of each piece with truffle butter and cover with cheese. Broil toast on a baking sheet 4 to 6 inches from heat until cheese is just melted. 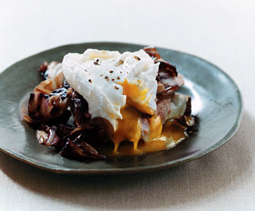 Divide toast among 4 plates, then top with radicchio and poached eggs. Season with salt and pepper.